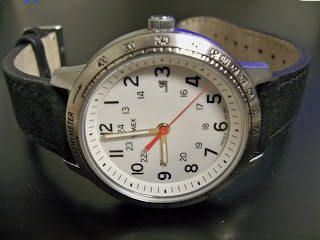 You've seen my newest old Timex; now check out my newest new Timex. Timex has recently introduced it's Weekender series of men's analog watches. They have a touch of preppy sophistication that would look right at home in the Hamptons, Cape Cod, Rehobeth, Nags Head, or Destin. Since Target had them at an attractive price, I couldn't resist. However, I upped the ante from the canvas straps of most Weekender watches and chose the Timex Weekender Tachymeter watch with a leather band. I think you'll agree that it is a beautiful watch. How do you manage all that time? All-White Mossimo Watch from Target. A World Class Casio for a Low Price! Bring Out Your Dead! Bring Out Your Dead Watches!